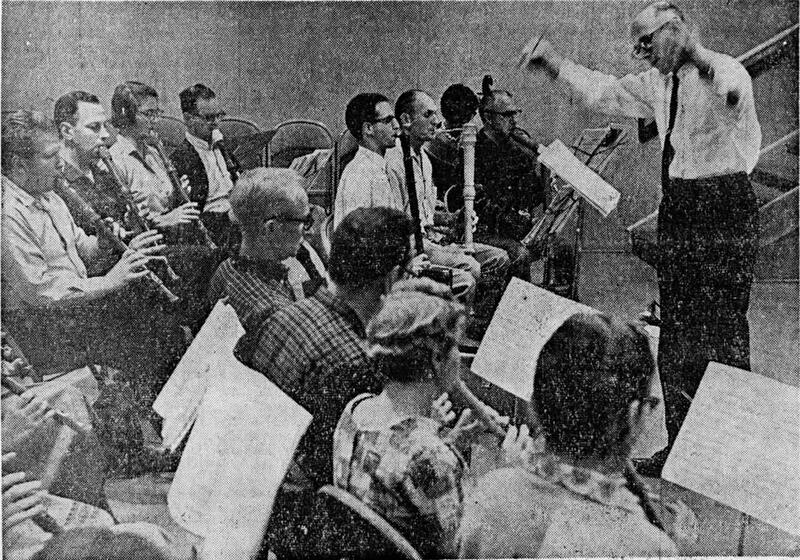 William Barnhart directs the Mid-Peninsula Orchestra during one of its first meetings in November of 1962. Photo from the Palo Alto Times. Under Bill�s direction the essential features of the orchestra were established. From the outset MPRO included great bass recorders as well as the common varieties from sopranino through bass. Capped double reeds, krummhorns and sorduns, were part of the orchestra from the beginning, as was a viola da gamba. By 1966 a harpsichord had also been added. There was also a strong commitment to regular performance, and this had been one of Bill�s goals when establishing the orchestra. MPRO�s first concert took place on May 6, 1963, and the program featured the orchestra as well as small ensembles made up of MPRO members and guest performers. While Bill was director, the orchestra appeared on Public Television station KQED, performed at the Palace of the Legion of Honor and gave concerts in the Palo Alto area. Members of MPRO provided the recorders needed for two performances of Noye�s Fludde by Benjamin Britten presented on May 3 and 5 of 1967 in Palo Alto. Consorts representing MPRO also took part in community outreach activities during the orchestra�s first five years and performed for a wide variety of local organizations. The first workshop presented by MPRO took place in 1963 and was directed by LaNoue Davenport. Over the next four years, the orchestra presented workshops directed by Friedrich von Huene, Gloria Ramsey and Hans Ulrich Staeps. MPRO meetings were originally weekly. In 1965, the orchestra�s meeting location was changed to Gunn High School in Palo Alto, and in 1966 meetings began to be held monthly and were divided into three parts: First, there would be performances by small ensembles, next everyone would participate in orchestral playing and finally those attending would be divided into two groups, each working on separate music with its own conductor. The first four years of the orchestra�s existence were the result of a team effort on the part of Bill and his wife Ilse to make MPRO a viable musical organization. In addition to playing recorder and viola da gamba in the orchestra, Ilse also took on several essential duties during those four years. These included collecting membership dues, ordering music from Germany and welcoming newcomers to the orchestra. When MPRO was reorganized in 1966 and a set of officers began to oversee its operation, Ilse served as consort coordinator and helped members of the orchestra form and maintain small ensembles. The reorganization that took place was meant to increase the orchestra�s membership and overall member participation in its activities as well as to relieve Bill and Ilse of many of the routine tasks involved in running MPRO. Part of the reorganization also involved making Angela Owen co-conductor of the orchestra at its meetings along with Bill Barnhart so that the members present could be divided at the end of each session into two large ensembles. Bill continued as MPRO�s music director, selecting music for meetings and performances, conducting concerts and arranging for performance venues as well as guest artists. Reminders sent to the membership in advance of monthly meetings began in November of 1966 and contained a list of the music scheduled to be played, news items and other announcements. By May of 1967 these reminders had become a newsletter for the orchestra. Listed below is the music for the next two meetings of the orchestra. Please note that there will be sectional seating for the Stradella Sonata, with those playing the Soprano 1 and 2, Alto 1 and Bass 1 parts sitting on the right as they face the conductor and those playing Alto 2, Tenor, Bass 2 and Contrabass on the left. Please observe this seating arrangement when you choose your place at the beginning of the meetings on November 7. Please note as well that sopranino and contrabass recorders as well as bass viola da gamba will be needed at both meetings, great bass recorders on November 7, and dulcien and krummhorns, on October 24. MPRO�S Workshop � Save the Date! The Mid-Peninsula Recorder Orchestra will present a workshop on Saturday, January 19, 2013 from 9:30 A.M. to 4:30 P.M. at Holy Trinity Episcopal Church, 330 Ravenswood Avenue in Menlo Park. The workshop will feature the music of Spain and colonial Latin America from the 16th to the 18th centuries. The workshop will be directed by Claudia Gant�var, who has a Concert Diploma in recorder from the Conservatory of Music in Geneva, has served as professor of early music studies at the University of Columbia in Bogat� and is the founder of the ensemble La Esfera Armoniosa. She has performed throughout Europe as well as in Latin America. For further information please contact Liz Brownell.